The way leaders are trained has not always been the same, however. As time goes on, it’s vital to adapt to the ever changing technological advancements by discovering new approaches to leadership learning and development. Let’s take a look at how leadership has evolved during the past 50 years. Traditional Classroom Training – Based on the level of technology in these two decades, classroom training was a sufficient approach to developing both new and current leaders. This form of educational delivery included workbooks, facility training and other hands-on based approaches to learning. An in-person method of training allows for a deeper connection to be made among both the trainer and trainee. This connection enhances both the impression left by the trainer and the level of understanding the trainee gains. Traditional Blended Training – The dot-com era accelerated the shift from classroom based learning to a balanced training approach. As the adoption of internet technologies became more prevalent, the methods used to train employees at all levels needed to change. This timeframe is where the traditional in-person, classroom training start to mix with new, technology driven methods of training. The combination of technology-based training mixed with face-to-face interactions allowed for a faster development process than the traditional approach could provide. This is due mostly to the efficiency that these technological advancements provided. Traditional Online Training – The universal adoption and advancement of technology in the late 2000’s with social networks such as Facebook and YouTube created a global shift in the way we communicate, and subsequently a shift in the way leaders are trained. 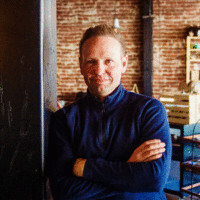 These social networks allowed us to move away from in-person training while connecting individuals at unprecedented rates. While the personal aspect of face-to-face leadership development was diminished, the efficiency and instant communication that technology provides have proven useful in the development of leaders on a global scale. Companies that have improved their approach to training and developing #leaders reported 77% lower turnover and 71% higher customer satisfaction. Learn more from @InspireSoftware:Tweet this! With new technologies being developed and introduced every day, it becomes difficult to determine which tools are worth implementing into your training process. Nonetheless, it is crucial that current methods of delivering leadership material are utilized. This is a far more effective approach to leadership training when attempting to increase performance, productivity and ROI than the traditional approach. So why are companies investing in leadership development? Employees of all skill levels are also aware when leadership development is not being prioritized or even considered. 63% of Millennials surveyed said their leadership skills were not being fully developed. This is detrimental to the growth of the individual and the company overall. How can we ensure our future and current company leaders are getting adequate, up-to-date training that will benefit not only employees, but your company's performance as a whole? Current #LeadershipDevelopment approaches are a dead end. Learn the new framework to developing leaders using actionable strategies and measurable results:Tweet this! The Leadership-as-a-Service model is the powerful new framework designed to revolutionize the way we develop leaders. Shifting the focus to hands-on experience means leaders will learn and develop their skills in the flow of work. This process moves away from the traditional training approach and instead implements leadership development integrated with real work. Shifting the focus to hands-on leadership experience means leaders will learn and develop their skills in the flow of work. This approach is the most actionable solution to an ever-changing leadership training landscape. How can you connect your organization's strategy to a successful execution? Clearly defined, attainable goals are the definitive link between leadership development and measurable results within your organization. Defining your goals while also keeping each goal attainable is the first step in an actionable approach. All goals should be attainable, with an outcome you can expect to achieve given your skills, motivation and values.&So how do we achieve attainable results? It begins with understanding the Leadership-as-a-Service framework. Leadership-as-a-Service is a continuously strategic approach to leadership development. This differs from more traditional training strategies which revolve around an event-based approach. Leadership-as-a-Service allows developing leaders to take the classroom learning theories and apply them in real-life, on-the-job situations.&Digital tools allow us to adapt proven leadership development strategies to the modern workplace. Software with the ability to set performance goals allows for ongoing mentorship and real-time feedback that event-based training cannot provide. Continuous development allows students of leadership to learn as they go and receive advice when they need it. This approach to leadership training provides a scalable solution that can be used throughout the organization. Implementing digital solutions provides a twofold benefit to training leadership, both new and experienced. New leaders are given the opportunity to develop core skills. Additionally experienced leaders are given the opportunity to learn about new technology from developing leaders. This provides an element to leadership where everyone is learning and growing in real time. Take strategic steps to create measurable results among the leaders in your organization with the Leadership-as-a-Service Strategy in mind. Whether measuring soft data based on people’s perception, or hard data based on objective behavior, you now have the tools necessary to understand how your team learns best.&Different generations have different strategies for growth and development and as such need an adaptable approach to leadership training. 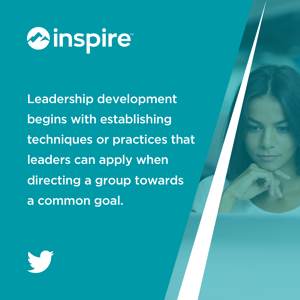 Inspire Software gives you the ability to take leadership development from an event-based approach to the continuous development strategy described. Learn more by watching a demo and register to request a personal tour of our software!